Surrounded by the stupendous landscape of San Gimignano and the vineyards of the famous DOC Vernaccia wine, il Borghetto is a vacation paradise with its 11 self catering apartments and private swimming pool. The vacation accommodations are a brilliant combination of color, light, and space, incorporating modern design & comforts with traditional Tuscan architecture to create an inviting and totally functional holiday home away from home. The lush green gardens, the many panoramic terraces and the large pool set among the olive trees, rosemary and roses is the perfect place for a moment of relax after a day of visiting nearby towns, wine tastings, shopping and museums. The owners have taken a historic building, which grew and expanded over the years and transformed it into a deluxe accommodation in the center of Tuscany with 11 apartments with 1 -2 or 3 bedrooms and kitchenette. Boasting unique floor plans, modern bathrooms, fully furnished kitchens and a mix of terraces, pergolas, and panoramic views, these holiday apartments truly represent the best of the Tuscan hillside. The special qualities of the decor include the use of color, light and homey touches to bring the apartments alive while creating a comfortable and inviting atmosphere. Capanna di Sotto, with its private entrance and pergola overlooking the vineyards invites you to linger over your morning coffee. Cucinone, encompasses what used to be the family kitchen with its large focolare fireplace andfeatures windows overlooking the valley. The Capanna di Sopra, is a free standing barn which has been transformed into a three bedroom two bathroom haven with a full kitchen, private garden with spectacular vistas and a fireplace. The Piccionaia, on the top floor, features more incredible views, beautiful bathrooms and an eat-in kitchen. Let Simona and Sandra know your requirements and they will help you find just the right apartment for your holiday vacation in Tuscany. Each apartment has a personality which invites you to live the villa and reminding you of its place in history with small touches like the restored afrescos, the traces of the old watch tower and the newly restored bell for the ex-chapel. Though rich in history, Il Borghetto has incorporated the modern comforts of today, all apartments are furnished with private heating and air conditioning, WiFi is available in the common areas and the kitchens in each apartment are furnished with extra accessories - like a panini maker - which will make your vacation stress free. There is a laundry service with washer, dryer and ironing accessories. The family Bimbi create a formidable team, taking care of you in every way. Upon request and a small surcharge, there is a breakfast service of coffee, tea, fresh croissants and bread each morning. On Tuesday, Friday and Saturday you can reserve your spot for a typical Tuscan meal which are prepared fresh in the onsite restaurant for the guests only featuring fresh ravioli, lasagna and Chicken with Vernaccia, just some of the specialities that appear on the always changing menu. And if you want to learn how to make some of these delicious meals, you can arrange for a cooking lesson and take home the secret family recipes. The extensive gardens are perfect for a moment of relax, a bit of silence for reading a good book, a cappuccino or glass of wine from the il Borghetto Bar at the reception office and all while appreciating the endless scenic views. The many terraces and common areas will give you the opportunity to wind down after a long day or a fun moment to spend exchanging stories with the owners of il Borghetto. There is a large swimming pool with lounge chairs, tables and umbrellas for your comfort and just above the pool by the soft shade of the olive trees are more lounge chairs for a bit of privacy. It is possible to walk into San Gimignano, stroll the trails around the vineyards or even do some fitness training, biking or horseback riding. The proximity to the incredible town of San Gimignano, a nice day tirp by foot or car, and it is just as charming as il Borghetto. Enjoy restaurants, shops, and the small quaint streets of this tower town before heading back to relax in your own private paradise. A little more off the beaten track, and for this reason even more cosy, is the town of Colle val d’Elsa where there are authentic enotecas with wine tastings and local culinary treats. Head towards the coast to enjoy the town of Volterra and it's highly skilled artisans in Alabaster artwork. Branching out for day trips can take you in any direction and still have you home to appreciate the sunset at il Borghetto. Travel to Florence and visit the museums, the art, the history and the gelato. Follow the panormamic roads that lead to Siena and its stunning Piazza del Campo and the Duomo with its marvelous marble facade. 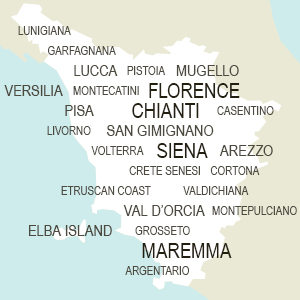 Find your way to the coast, and enjoy the renowned wines of Bolgheri or the Blue Flag beaches of Tuscany. Your options are endless! I am proud to say our family has lived for generations in this area and we love where we are, always searching for way to preserve its natural beauty. As children, our parents would take us to explore the area and the trails of the via Francigena, which goes right up to the city gates of San Gimignano. For us kids, it was a magical and mysterious place, with antique forests that had been left to themselves for years and years and this villa was immersed in the wild brambles. We grew up with a dream to bring it back to life, and after three long years of hard work, where each in our team brought their own special skills, we can say, we finally did it! Sandra, our irreplaceable designer, Riccardo and Nicola put in many hours of hard work and the entire family did their part. By now it is 15 years that we are living and loving this splendid adventure together, and sometimes it seems like we opened our doors just yesterday. We have have the wonderful opportunity to meet so many new people, from all over the world, sharing their traditions and our love for Tuscany.